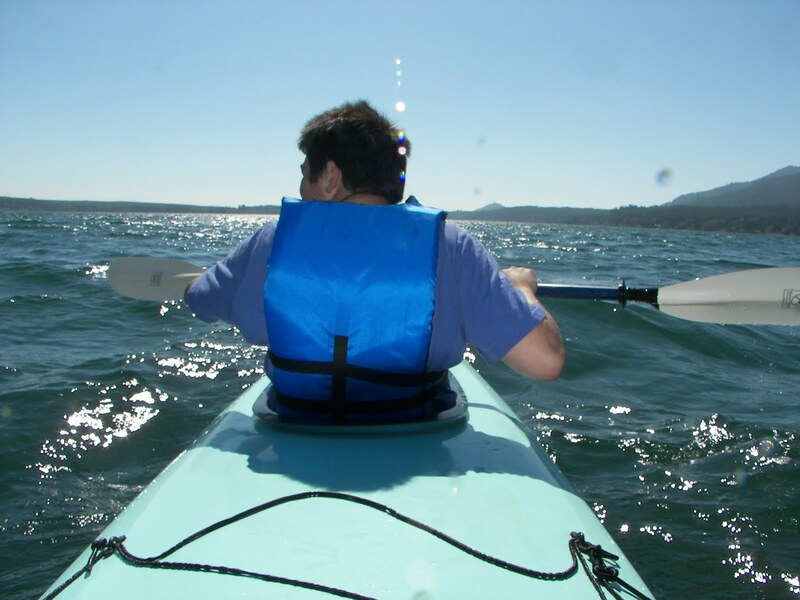 We finally got a chance to kayak on Lake Quinault. I've hauled my kayak out there before in the off-season, only to learn that the Quinault Tribe only permits boating of any kind on the lake between Memorial Day and Labor Day. This does make Lake Quinault probably the most serene and undisturbed large lake in the state in the off-season. We launched from the Willaby Creek Campground on the South Shore Road near highway 101. The campground has a day use area with free parking, picnic tables, a beach, and a boat launch. Our route took us along the south shore, passed the Lake Quinault Lodge, passed the Rain Forest Resort Village, and then to find the mouth of the Upper Quinault River. The river mouth turned out to be quite a ways from the Rain Forest Resort and the last sign of civilization. We ended up about as far from Willaby Creek as you could get. I had observed just the week before from the mountain road that takes you passed Higley Peak that the river breaks up into several channels and forms a river delta. We stopped at the first channel we came to - the southernmost. Far before the river entrance we hit a bank of mud that extends 100 feet out into the lake. The water here was maybe four inches deep - not enough for our double kayak with two people. A single kayak should have been able to navigate up the river. In clambering through the mud to reach the bank, I found myself sinking a foot or two here and there, but generally the area seemed to be safe. We walked a bit up the river. There was no very firm ground to walk on anywhere - just mud or very crumbly sand. We noticed the tracks of a deer in the mud. Lots of birds were active. It was a pretty spot with the forest growing along the river banks, the lake behind, and the mountains above. We didn't stay long, since in the meantime, the wind had picked up and was blowing strongly against us. We set a course directly across the middle of the lake towards the campground. It would probably have been safer to follow along the shore and try to avoid the wind. Out in the middle of the lake we caught a few waves that broke over the kayak and dumped a little water inside. If the wind had picked up any more, I would have steered us for the nearest shore. However, passed the middle of the lake, the waves were not so active. We were sitting in an inch or two of water by the time we reached the campground. 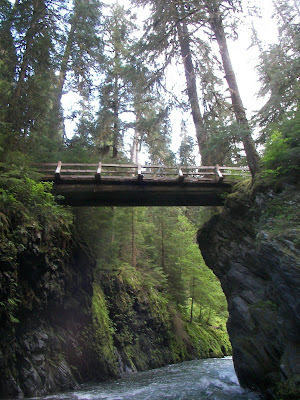 I have a new favorite hike in the Lake Quinault area: the Pony Bridge. The Pony Bridge spans a narrow canyon where the East Fork Quinault River is forced through a narrow channel between giant rocks. The water rushes through here as fast as I've ever seen water move. It's an exhilirating sight, which the photos can't fully convey, since you are missing the sound and the movement. You must go visit yourself! You reach the trail by driving down the South Shore Road to its very end - 19 miles from highway 101. You'll pass the Graves Creek campground just before the trailhead. We picked up two Evergreen College students along the road at Quinault who needed a 12 mile ride to the campground. They had arrived by bus and we came along at just the right moment for them. They were planning a one week camping trip in that remote spot. The drive beyond Lake Quinault and along the Upper Quinault River was very beautiful: both the deep green mossy forest all around us and the rushing river on our left. We dropped off our hitchhikers and reached the trailhead. The trail starts at a bridge over Graves Creek, which is itself a beautiful spot. If you didn't want to hike, just a drive to this point and the view from this bridge would be worthwhile. The hike to the Pony Bridge is two and a half miles long. It lies along a longer 11 mile trail to the Enchanted Valley in the middle of the Olympic National Park, which I read is one of the special places on the Earth. We passed several backpackers who were returning from there. Our portion of the trail rose steadily for 2 miles; however, the climb is gradual - not too strenuous. At the top of this climb is an ancient, rotting picnic table, which was mentioned in the guidebook. Up to this point the trail used to be a road. You could see where the park service had strewn logs and debris to narrow the trail to a normal track, encouraging native vegetation to grow. From the old picnic table the trail climbs down towards the bridge. You get a glimpse first of some rocks carved by the river when the water level is high. The guidebook said you could sun yourself here on a the rare sunny and warm today. This day was not so warm. Also, there's no obvious trail down to these rocks. You would have to struggle through a lot of undergrowth. Shortly beyond this viewpoint we reached the bridge. The whole scene on every side here was breathtaking. Downstream the river raced through a narrow canyon bordered by steep rock walls. Every crevasse on these rocks was taken over by an opportunistic fern. Looking upstream was a wider view of the river issuing out of the forest and careening against the solid rocks. The sound and the drama of the place heightened the experience. We climbed down some steep rocks to a small beach at the riverside. The water in the middle of the channel seemed like it was rushing by at 60mph. If you fell in, there would be no hope for you. On the other side of the bridge we followed the river down an informal trail for further views of the canyon. Altogether, I think we spent an hour around the bridge. I'm getting old. A five mile round trip hike is about the limit of what I can handle. When we reached that grassy meadow on the way back, I flopped on the ground and had a long rest. On the drive back towards Quinault we were lucky to come across several Roosevelt Elk.